With the final touches complete, here's a first look at the complete Weston Garden designed by Tom Stuart-Smith. 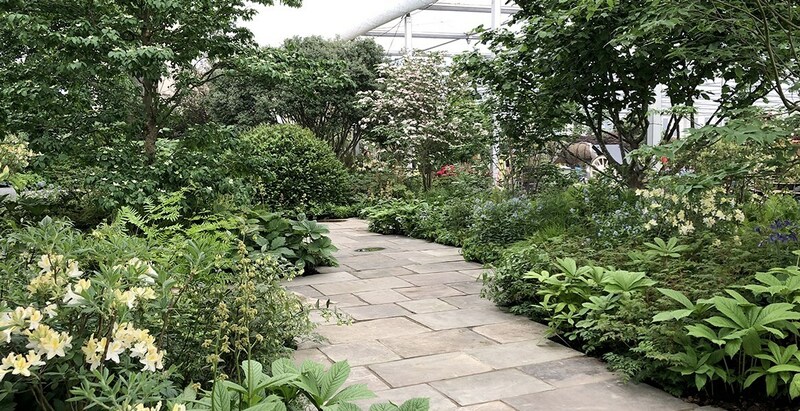 The space in the pavilion enables us to use a number of extraordinary plants that have been centrepieces of previous Chelsea gardens. The Weston Garden is full of texture and variety and structured with evergreen. 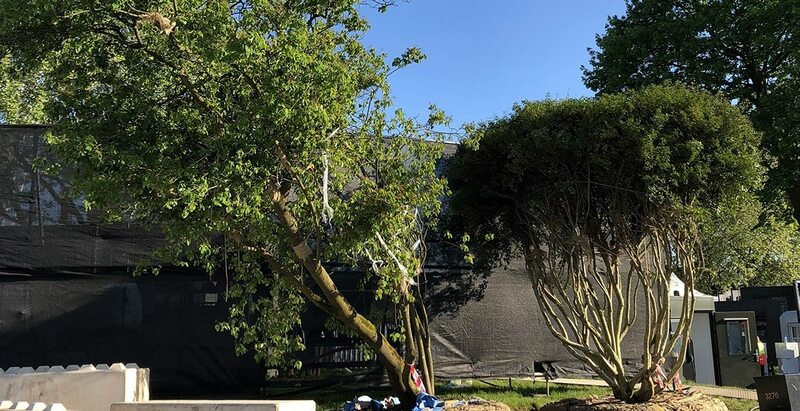 Situated in the Great Pavilion, building Tom Stuart-Smith's design for the Weston Garden has presented its own challenges. Our main one has been transporting the large trees and shrubs that are featured in the planting plan. 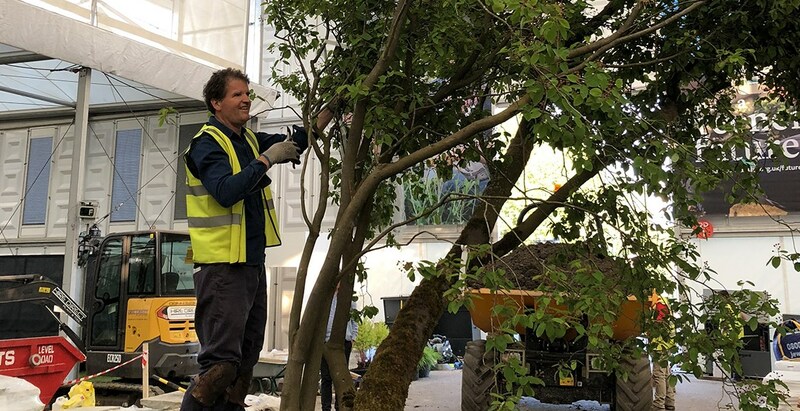 For the giant Tilia that forms the centrepiece of the garden, which is likely to be the largest tree at the show, we had to hire a special forklift truck to transport it. Trees lined up outside ready to go into the Pavillion. The first of the big trees arrived on Friday. The large Tilia arrives at the Pavillion. The Tilia on the photograph is 9m tall and is likely to be the largest tree at the Show! Weighing 7 tonnes, we needed a special forklift to transport it. Installing plants and building paths around the Monument in the Great Pavillion. Constructing a square in the centre of the garden. The giant Tilia trees forms a dramatic backdrop to the Buxus, Taxus and Cornus in the foreground. Japanese Dogwood looms over Tellima and other foliage. Tom Stuart-Smith takes a well-earned break from planting. The garden really starts to take shape with the structural large trees and shrubs in place. Tom Stuart-Smith doing a spot of pruning to ensure perfection in the Weston Garden. 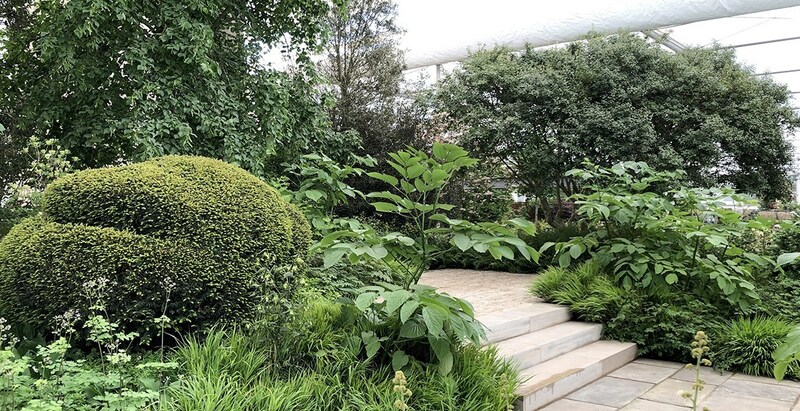 We've only just started work on Tom Stuart-Smith's garden and given that it's bigger than a typical show garden, we're operating on a very tight timetable. The first of the big trees arrived on Friday. The Tilia on the photograph is 9m tall and is likely to be the largest tree at the Show! Weighing 7 tonnes, we needed a special forklift to transport it.